The village of Silverdale, with its western aspect and views across Morecambe Bay, can lay claim to the best sunsets in the country – which can be viewed from Jack Scout or by climbing up to the Pepperpot on King William’s Hill. It’s a perfect place for an adventure, through the trees of Woodwell, or with some rockpooling on the shore. It’s been home to the Burrow family of farmers and butchers for around 120 years. Burrow’s butchers shop on Emesgate Lane is a fixture of life in the village. Nick Burrow, his uncle Walter Burrow, and Nick’s stepson Ian now run the shop. Burrow’s meat has been trusted for years by local hotels and restaurants – and was originally supplied using a horse and cart. Nowadays they use a van, but the products are just as popular, with deliveries made six days a week to customers including the Wolfhouse Kitchen, Arnside’s Old Bakehouse and the café at RSPB Leighton Moss. They also distribute to customers as far afield as Grange and the Winster valley. 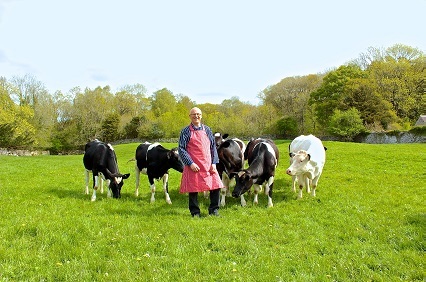 Burrow’s source local produce for the shop – selling locally reared pork, lamb, and beef. As much comes from within the immediate Arnside and Silverdale area as possible. Top sellers are their award-winning Cumberland and traditional pork sausages, which are made daily on site.